This from winemaker Bob Mayfield: “They said it couldn’t be done, and they were almost right. After nearly two and a half years of planning and building, Windy Hills Winery is finally going to open. Owner Dave Kelly texted me at 1 pm Friday to let me know we got the final OK from the county, and here we go! We’ll be open Memorial Day Weekend, noon to five, Saturday, Sunday and Monday. 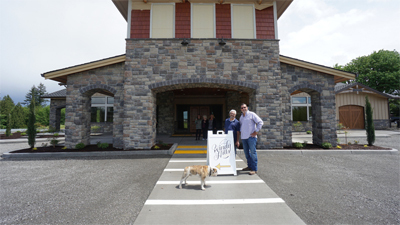 The winery is at 1360 S. 38th Ct. in Ridgefield. The Windy Hills lineup consists of two vineyard designated Pinot Noirs, a bodacious Reserve Pinot blend, a Tempranillo, and a party red blend. We needed to source juice from elsewhere to fill out our roster, so we grabbed some amazing Viognier (seriously! ), Malbec, Syrah, and a Bordeaux blend, all from Walla Walla. We’re starting with two tasting menus, $10 for a flight of five wines, wines by the glass, and beer from a Hood River brewery, whose name I cannot remember. As wine maker, I will be releasing my wines under the label Spudders Crest (I just got labels approved this morning! ), and I’m starting with an estate rosé of Pinot Noir, though I have to call it Homegrown (don’t ask), and a fabulous Sunnyside Vineyard 2014 Pinot Noir. I also have an O! Naturelle wine (no sulfites added) that I hope to release next week, a couple more rosés, and in a couple weeks a Cheep Cheep White Wine, an Auxerrois, some fruit wines, and a hopped apple cider. Phew! BTW, I promise, I will not spam anyone, and will only send out emails to people who really want them. And finally, Windy Hills is a fabulous building, a first class event center (I know what you’re thinking, how did I get involved? ), just a gorgeous location. That’s all for now. I hope to see ya’ll soon. It’s gonna be crazy!